More than one adjective before a noun we connect them with a hyphen. No hyphen when it comes after the noun. The blue-eyed cat has just had a bath. When we use more than one adjective before a noun, which are one idea, we connect them with a hyphen. • He is a good-looking man. • The slow-moving train arrived late. When the adjectives come after the noun we don’t use a hyphen. • The blue-eyed cat has just had a bath. 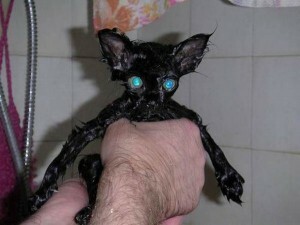 • The cat with blue eyes has just had a bath. • The train was slow moving so it arrived late. When the adjectives before the noun are different ideas we put a comma between them. • The furry, black cat. Remember: Before the noun with a hyphen. After the noun no hyphen. Re-write the following sentences as in the example. A train which moves fast. A pupil who works hard. A book which has 250 pages. A child who is well behaved. A footballer who is well known. An old man with a narrow mind. A woman who is well dressed. A man who looks good. An optician who is short sighted. A wall that is well built. A driver who travels long distances. 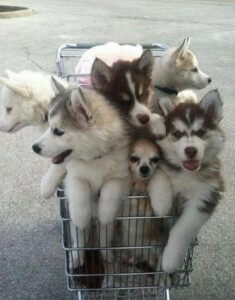 I have just bought six puppies. They are four months old. I also have a five-year-old cat who I imagine will be very happy to see them.